Fall is definitely rolling into South Georgia this weekend following some beneficial rainfall for the past couple of days. My peanut farmer neighbors who are trying to pick their peanuts probably are not as happy with the rain as we are, but these rains have fallen on Riverview at a very opportune time. We just planted our winter rye down the sides of the lodge road, and are in the process of planting our winter grass around all of the cottages. 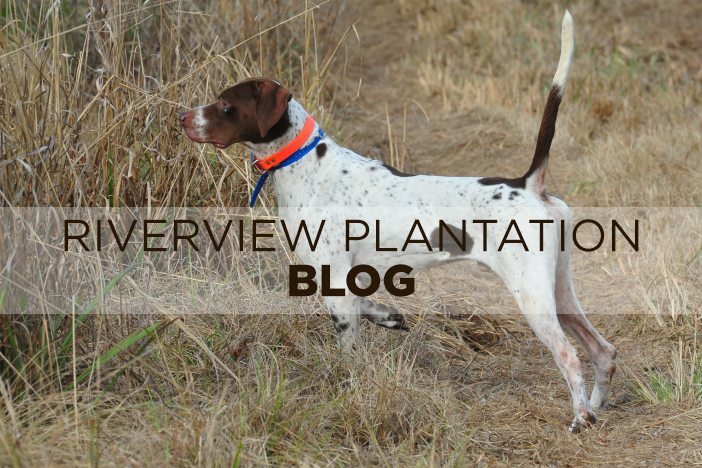 This week we also began working all of our hunting dogs into playing shape. Each guide is taking his string of dogs out for two and a half hours in the morning , and is supposed to be shooting a few quail over them. I used the word “supposed” since unconfirmed reports have some of our guides shooting “AT” birds. However, it seems that a number of birds are failing to cooperate by falling dead, and our retrievers are grinning and relaxing. Next week we will move up to running the dogs for an entire morning. Dogs, like any other athletes, have to play themselves into shape. The kitchen and housekeeping staff began work last week going through all of the cottages with a fine tooth comb. It always amazes me how everything is working when we shut down in late March. Somehow during the summer months, the gremlins perform their magic in almost every cottage. Our plumbers, electricians, and heating and cooling folks are having a field day fixing items that were working great six months ago. Oh well, it could be a lot worse. I could be President Obama, and not have a clue how to deal with Mr. Putin. I’m fairly conflicted about what we should do in Syria. President Obama drew his famous red line in the sand for Assad which he crossed with impunity while we did nothing. Now geo-politics is not my strong suit, but I think that Assad is now fighting ISIS. ISIS is nothing more than a bunch of barbarians while Assad is a butcher of his own people. Whose side should we be on ? Why isn’t the best policy just to vacate the region, and let them all kill each other. I can almost guarantee you that they will turn on their Russian allies when they have no one else to fight. I would not want to send my son or daughter over there for a bunch of folks who hate us. I have about decided that the line to the old country music song summed it up best when it said, “God is great, beer is good, and people are crazy”. This is a crazy world that we are living in these days. If you want to escape it for a while and see some of the most beautiful woods and best quail hunting in the world, come see us ! !